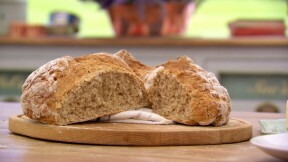 This soda bread recipe is Paul's interpretation of the signature challenge in the Bread episode of Season 3 of The Great British Baking Show. It is explained in further detail by Paul in Masterclass: Part 2. Preheat the oven to 392F. In a large bowl, mix together the two types of flour, bicarbonate of soda and salt. Add the buttermilk and mix until a sticky dough forms. Lightly flour a work surface and tip the dough onto it. Gently roll and fold the dough a couple of times to bring the mixture together. Do not knead. Shape the dough into a ball. Flatten the ball gently with your hand. Score the dough with a deep cross dividing it into quarters. Dust the bread with flour. Place onto a baking tray lined with baking parchment and bake for 30 minutes at 392F. The loaf should be golden-brown. Leave to cool on a wire rack. This is best eaten on the day of baking.